Friday. Beautiful Fantastic Snow Day! Woohooooo! We are all stir crazy here in Nashville after 8” of snow and three days of icy roads. You can call us “wimps” if you’re still snowed in with 24” of the white stuff. But we are Southerners and we just aren’t prepared for this stuff, at least not for more than one day! What do I do when it’s forecasted to snow? Head to the grocery, of course, for a marathon weekend! Yippee! My first thoughts in a weather crisis go immediately to meat sauce and comfort foods. A big pot of thick, rich red tomato sauce simmering on the stovetop while sending smells of fresh garlic and herbs throughout the entire house. My older son surprised me too and brought home 3 more hungry teenage boys after a long day of fun. Whew, I have been busy and happy bee! We had heard about the upcoming storm headed our way, and began discussing what pasta dishes sounded appealing. Timballo is one of her son’s favorite meals, and versions have been inspired by the old 90’s movie “Big Night”. The two brothers served “Timpano”, a pastry wrapped layered pasta dish that created a “WOW” presentation. (note: see movie!) And since then many Timballos (Italian layered pasta dishes) have been created including layers of meats, seafood, vegetables, mushrooms, eggs, and many other ingredients. 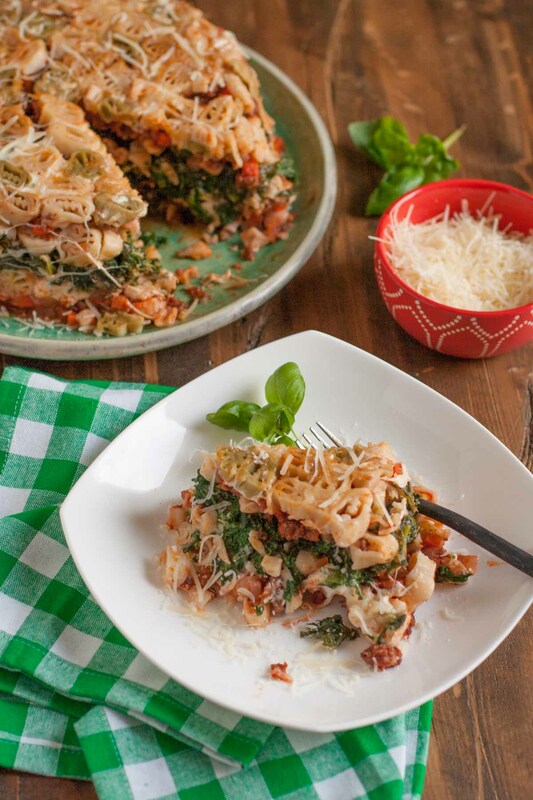 This thick, hearty and complex Timballo is a combination of a multi layered lasagna and spaghetti casserole. 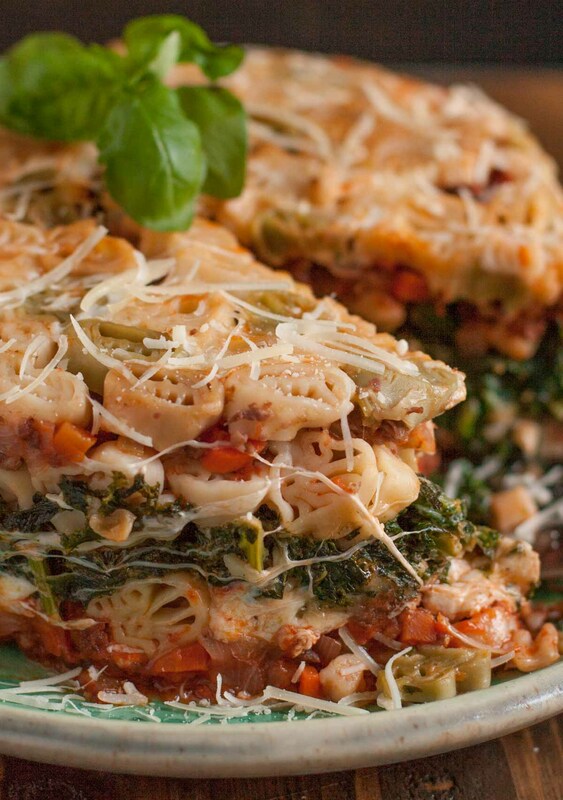 Nine separate layers of cooked pasta, meat, tomato, creamy kale, and fresh cheeses throw a party on your tongue. A tailgate party! Tons of texture and flavor…this Timballo is a labor of love. And with the Super Bowl just a few weeks away, using our Tailgate Pasta (footballs and helmets) seemed ideal – and a fun meal to present and serve to your guests…or at any other “home” tailgate event during the year. Two days is perfect to create this at a leisurely pace. And there was nothing like the snow storm of the decade to make this weekend the perfect time to tackle the Timballo. Each component of the Tailgate Timballo is an important step and takes focus and time. 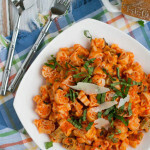 The whole peeled tomatoes are gently crushed in a food mill and simmered with sausage and diced carrots, celery, and onion, and seasoned with just the right herbs. 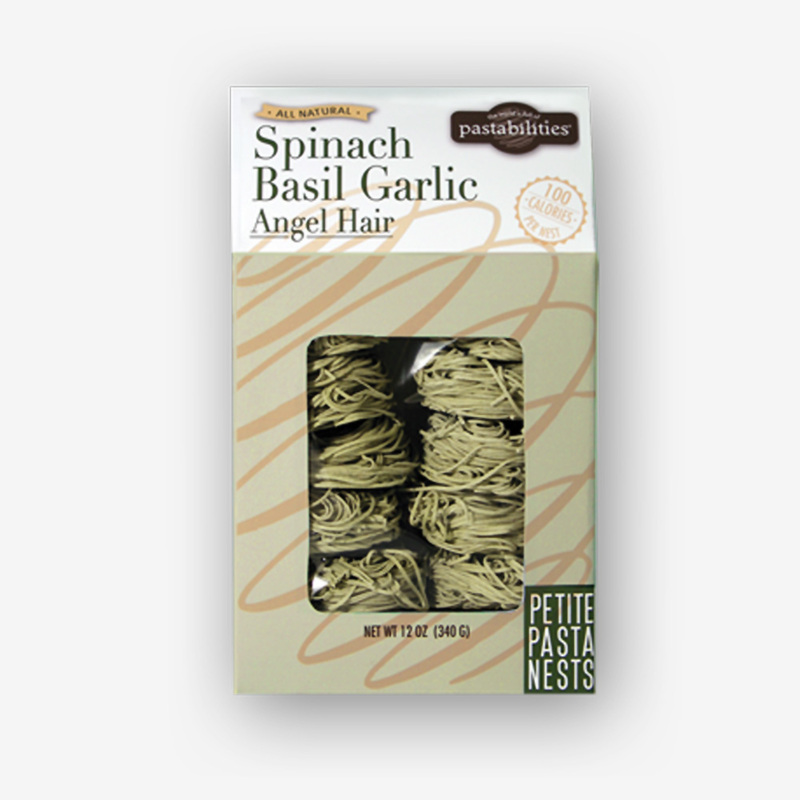 This alone would be heaven over any pasta…but you must set it aside. Fresh kale mixed in a flavorful bechamel could be eaten alone as a side dish…but alas, it must too be set aside. Add fresh Parmesan and fresh mozzarella cheese, and of course the football and helmet pasta to the layers– and you are ready to assemble a mountain of goodness! 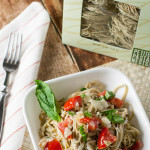 Pasta – place shapes in a beautiful design! Knowing I had few days on this, I made the tomato meat sauce one day ahead. But really all components could be made and/or chopped ahead of time. 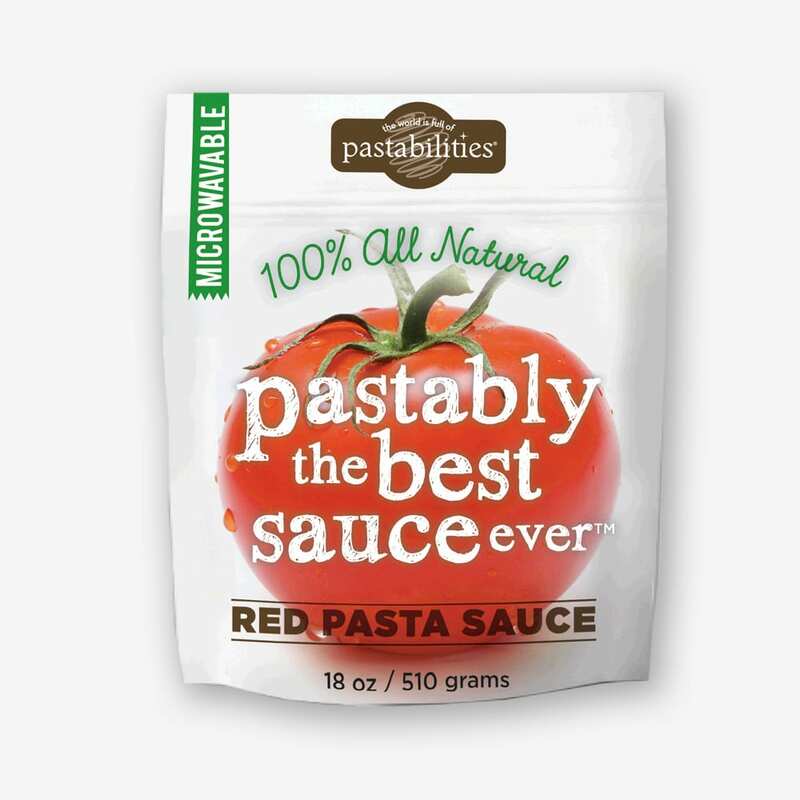 Even the pasta can be cooked, drained, and tossed with a little olive oil, and stored in the fridge ahead of assembly. 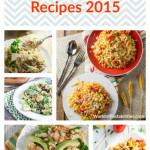 Whatever you decide about timing, this is fun and a must try dish! 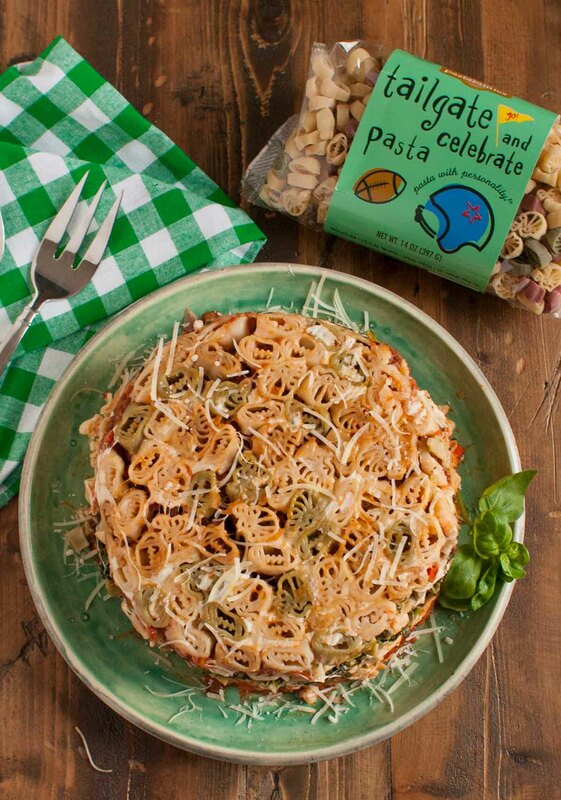 I LOVE the fact that any pasta shape can be substituted for any celebration or event – from penne, to any sport, theme, or holiday shape. 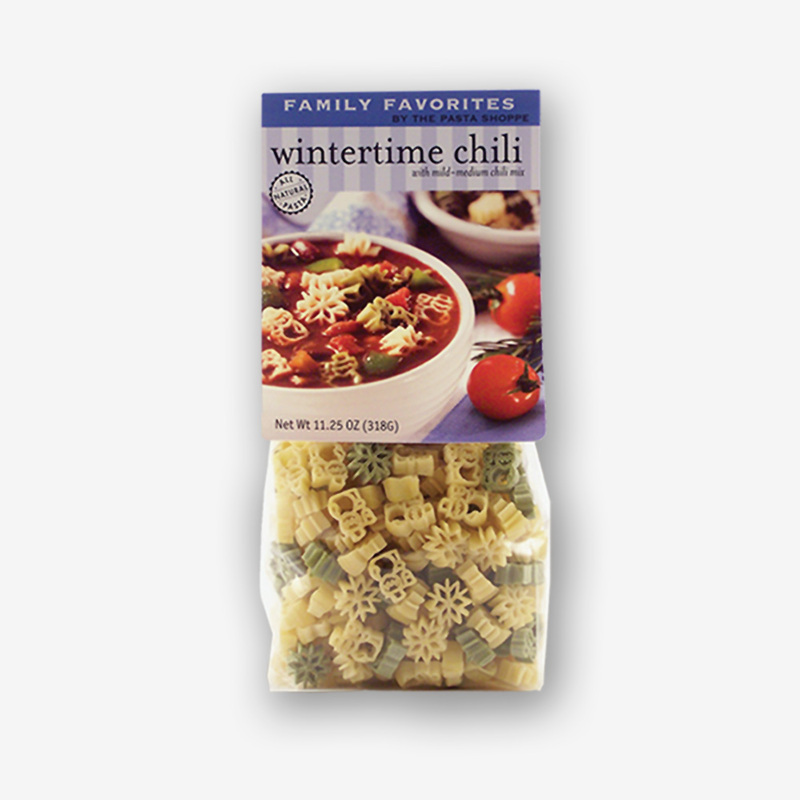 Can you imagine Christmas Tree pasta for Christmas Eve dinner, or Halloween Pasta for a pre-Trick or Treat dinner?! It’s just fun. So friends, be safe outside and adventurous in the kitchen this winter. 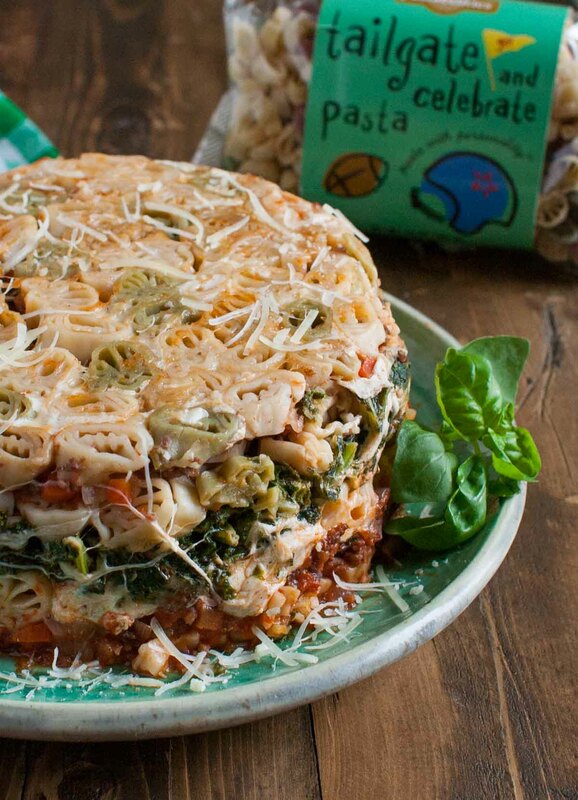 Stay warm and please let me know what happens when you tackle this Timballo! 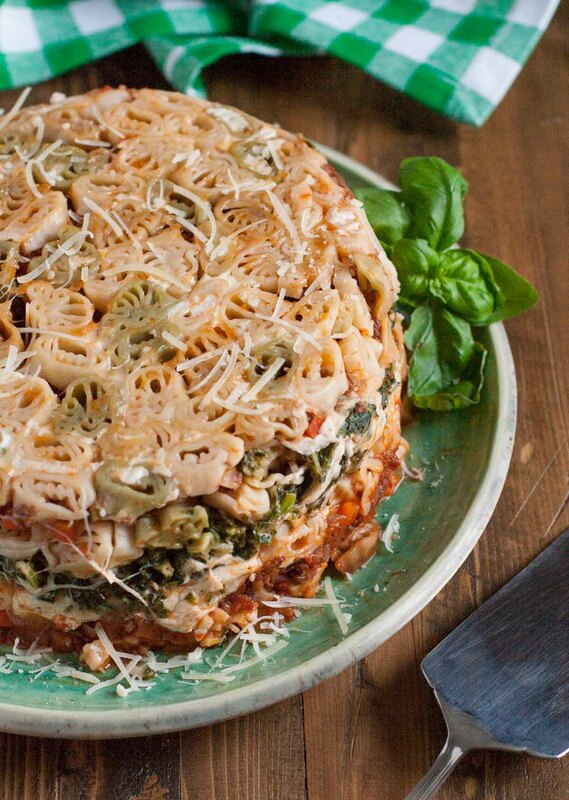 A wonderful layered dome of pasta...nine layers of a tomato meat sauce, kale bechamel, fresh cheeses, and fun pasta! A "wow" for entertaining and fun for any holiday or occasion! I used Tailgate Pasta...but any shape can be substituted like penne, Christmas Trees, etc. Heat olive oil to med-hot in a large saute pan, and cook sausage, breaking it into small pieces, approximately 5-7 minutes. Add chopped onions and bay leaf, and saute until onions are translucent, approximately another 5-7 minutes. Add carrots, celery, and saute until veggies soften, about 4-5 minutes. Add tomato paste and stir for one minute. Add red wine, and turn heat to to high until you have a boil, and scrape up any brown bits, an until almost all liquid is evaporated, about 1-2 minutes. Add tomato puree (after whole tomatoes have been run through food mill), sugar, red pepper flakes, stirring frequently until sauce thickens, approximately 8-10 minutes. Remove bay leaf and set sauce aside to cool. (can be made ahead and stored in fridge). Cook pasta according to directions, drain, and rinse with cold water, and toss with 1 T. olive oil. Set aside or store in zip lock in fridge until ready to assemble. (can be made one day ahead). Cook kale in pot of simmering water, for 5 minutes, until tender. Transfer to a bowl of ice water. Drain kale and squeeze out excess water. Chop again if needed. Melt butter in large sauce over medium heat, add garlic, and stir for one minute. Add flour and whisk for one minute. Add milk slowly while whisklng. Reduce heat and simmer, whisking occasionally, until sauce begins to thicken, about 5 minutes. Add kale, salt, pepper, nutmeg, and 2 T. Parmesan. Stir and remove from heat. Spray souffle pan (mine measured 8¾' x 3 12", approx 2 quarts) with cooking spray, then line the bottom of the pan with a round of parchment paper, and spray the parchment round as well. Cover bottom of pan with a single layer of pasta. Make a pretty design, as this will be the top of your Timballo! Spread 1 cup mozzarella cubes and 3 T. Parmesan over pasta layer. Spoon ½ the meat sauce carefully over the cheese. Add about ⅓ of pasta left over the meat sauce. Add all kale mixture on top of meat sauce. Top with remaining mozzarella and another 3 T. Parmesan. Spread the rest of meat sauce evenly over cheeses. Place another round of parchment with oiled side down on top of pasta layer. Cover dish with foil and press down gently on layers. Bake dish in a water bath (I put mine in a large roasting pan, water should come up to about ½ of souffle dish) for approximately one hour. insert a metal skewer or thin knife into center, and if hot to touch when removed, dish is done! Remove from oven and water bath, and let dish stand for 15-20 minutes. Remove parchment and run thin knife around edge of dish to loosen Timballo. Cover dish with slightly larger serving platter and carefully invert dish and platter with gloved hands (it will be hot, and you don't want to drop it). Carefully remove souffle pan and parchment. Jump up and down - you did it!! Slice pieces of Timballo like you would a pie, and serve with fresh Parmesan and chopped fresh basil. A total WOW in presentation and what sound like best textures and flavors! So appreciate detailed instructions and hints on doing so much ahead of assembling…love it…comfort food worthy of entertaining!!! 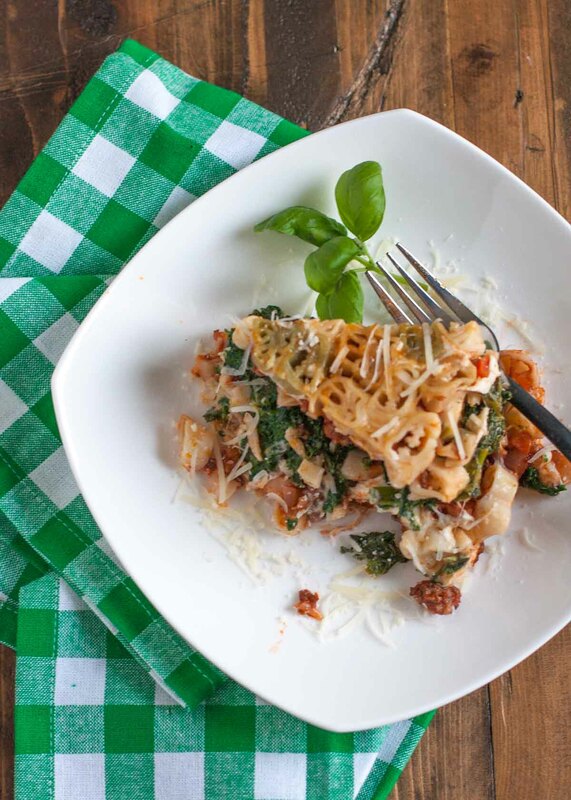 And kale layer may not be so healthy in bechamel, but adds to eye appeal and surely to the “chew” not found in lasagne or spaghetti casserole….can’t wait to try this creavive and impressive recipe! 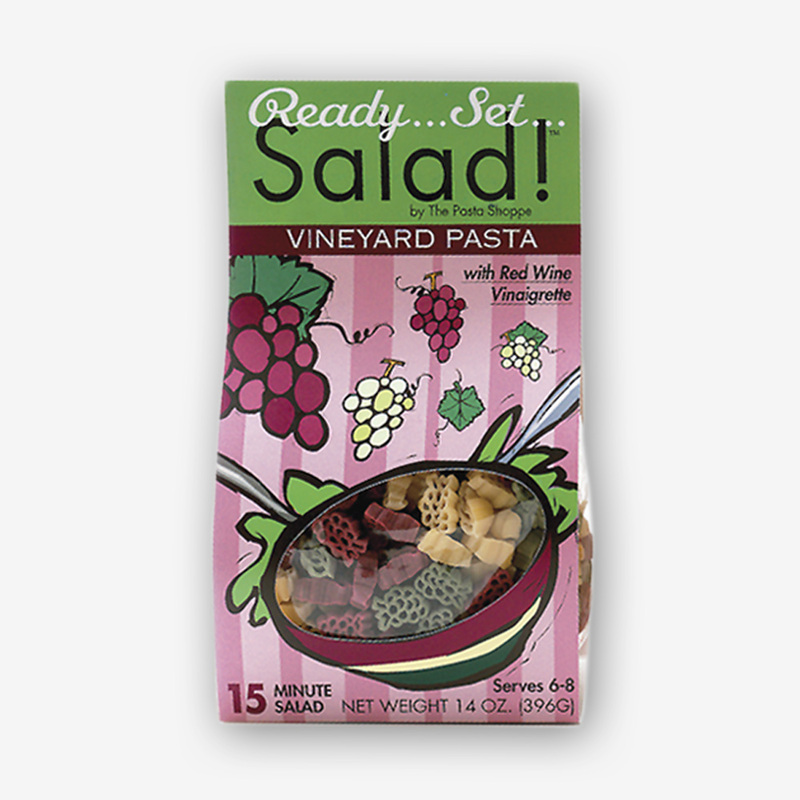 Am making my grocery list (and guest list), and wondering what salad might compliment? Keep them coming, Carey, we love pasta! We’re not hosting Superbowl this year, but your football shapes were perfect….think I need your snowflake shapes, as we are snowed in! Thanks Alice! The snow is now gone here…and so is the Timballo! Let me know how you like it! It’s worth the effort to make! lol is right! Really good though…and fun to make! Please try it and let me know how it goes! WOW! This Tailgate Timballo Looks Delicious!! Going to make this for our Party!! Wow! This is a gorgeous dish and looks delicious! !